Comptonia peregrina (L.) J. M. Coult. 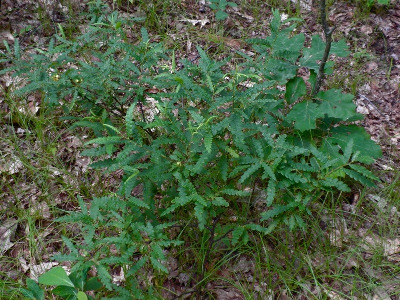 Sandy plains and hills, usually in open savanna of oak, aspen, and/or jack pine; especially conspicuous and abundant on sandy, cutover pinelands in northern Michigan. Becoming rare and local in southern Michigan. This species is sometimes included in Myrica, as Myrica peregrina (L.) Kuntze. MICHIGAN FLORA ONLINE. A. A. Reznicek, E. G. Voss, & B. S. Walters. February 2011. University of Michigan. Web. 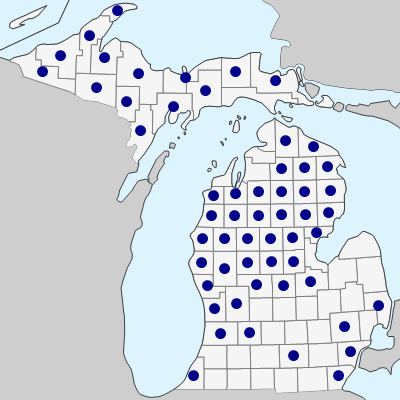 April 21, 2019. https://michiganflora.net/species.aspx?id=1704.